Website speed is something which really matters today after SEO. Once you write good SEO for your website/blog, your task is not over. Website loading speed is also one of the most important factor for search engine ranking and good user experience. Even in mid of 2015, Google made it official that if your website speed is slow i.e loading time is more, than your blog/website can be penalized. This will also affect on your revenue. I had personally experienced it. There are couple of things which you need to replace or fix to increase website speed. I will write one complete tutorial series soon on it. But today we just gonna see the speed test tools only. Both websites I guess doesn't need any introduction, but as you all know google loads pretty faster than any other website in the world. Yahoo will load very slow, they might need to work on it. It loads slow because they load the whole website on the home page only which contains everything i.e top news, entertainment etc kind of stuff. Where as google just loads one logo with one search box that's it. This is really an smart strategy which we should observe and learn. I also read 1 analytics once about eCommerce websites. As you guys know they made thousand's of dollars daily. Amazon company revealed that, they made extra profit of $1.6 million dollars in a year just by improving site speed by 1 second. So, you can imaging in today's worlds visitors are in rush. If you website doesn't opened in 3-4 seconds they will leave and eventually you will face huge loss. Visitors are traffic and traffic is revenue ! So in this tutorial I will show you couple of website speed test tools, by which you can check your website loading speed and find out the bugs and errors affecting it. These tools will give you complete analysis and factors affecting your site's speed. I will show you best 10 tools whose priority is from top to bottom. So start using tools from top. This tool will give you complete analysis about your website i.e which images, js, css and html files affecting site speed. You will come to know the improvements areas of your blog/website. I must say, it is a must try tool. 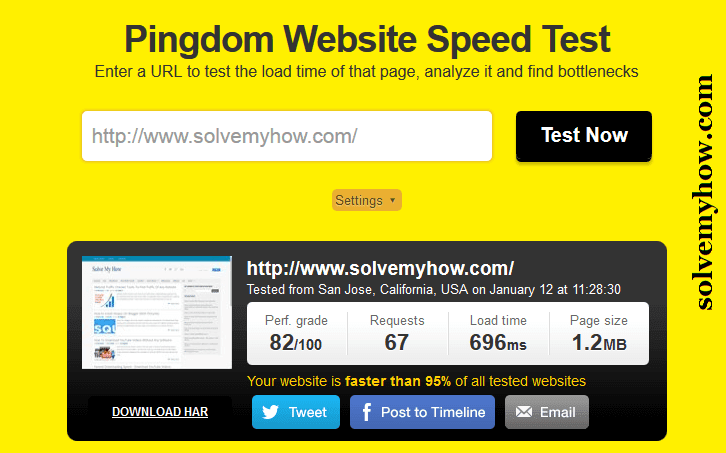 As you can see in the above snap shot, SolveMyHow loads in 696ms and it is 95% faster than all other websites. GTmetrix is second recommendable tool. This will give you complete page details i.e page load time, total page size etc. It will give you page sight score (google tool) and yslow score (yahoo tool). So, ultimately the result will be based on these 2 tools. You will also get recommendation from GTmetrix, which you need to improve to increase website speed. P.S Just re-run the test twice or thrice and cache plugins will do all the magic. This is another amazing tool developed by yahoo. You have to install this tool on particular browser. Just go through the above link and download it for particular browser you're using. This is another tool for website performance and optimization test. It works pretty similar as above 4 but the best part is you can select particular location and browser, look at the snap shot below. Check you website speed and reports will be sent to your inbox. Compare your website speed against your competitors. So, these were 10 amazing website speed test tools. As I said above, website speed matters alot. So use these tools, find out the errors and fix it. Try to load your site within 3-4 seconds max. Do use responsive template for serving mobile optimized versions. Do let me know which tools do you use to check loading time of your website ? If you found this tutorial interesting and tools worth using then don't forget to share it with your friends on Facebook, Twitter and Google plus. P.S you can also subscribe for SolveMyHow newsletter to get latest update about SEO, blogging widgets and tools right into your inbox.